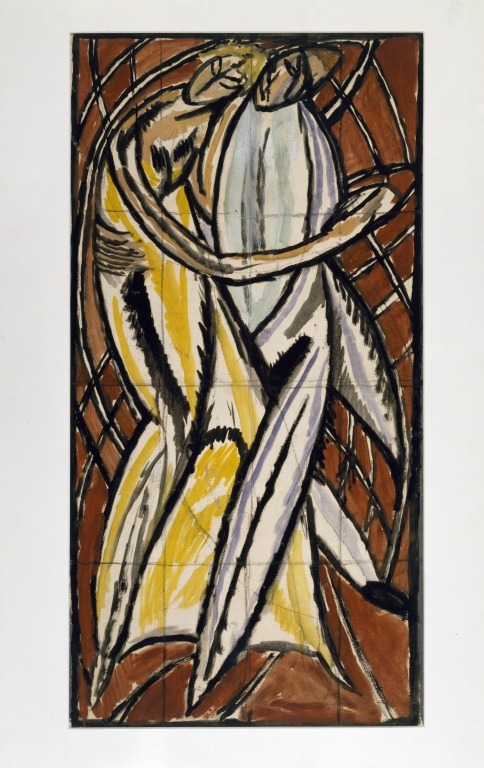 Given by Miss Margery Fry, J.P.
Abstract design representing a couple dancing. Background is brown, she wears a yellow dress, he wears a blue outfit. It is squared in chalk for enlargement. On the back is a ruled pencil drawing of panelling. Produced for the Omega Workshops Ltd., ca. 1913. Mr Duncan Grant states that this design was one of two panels painted in oil and placed on either side of a window as shop signs on the first floor. 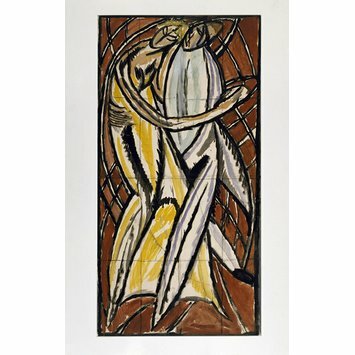 One was painted by Wyndham Lewis, the other by himself, but he could not state certainly which was his work. The work was reattributed to Vanessa Bell by Richard Shone, Tate exhibition catalagoue, 1999. Vanessa Bell (probably, may be Duncan Grant). Dancing couple in bodycolour and oil on paper, ca. 1913. Gerrish Nunn, Pamela, From Victorian to Modern. Innovation and Tradition in the work of Vanessa Bell, Gwen John & Laura Knight London : Philip Wilson Publishers, 2006. 111 p. : col. ill., ISBN: 1900809419. Conversation Anglaise le Groupe de Bloomsbury Paris: Gallimard, 2009. ISBN: 9782070127306.